Servicing a population of nine million people, Mexico City is said to offer fewer than 45 official emergency ambulances. That bafflingly oversight has resulted in a band-aid solution — quasi-legal private ambulances. That's the basis of Midnight Family, a verité doc that doubles as a nail-biting thriller from director Luke Lorentzen. 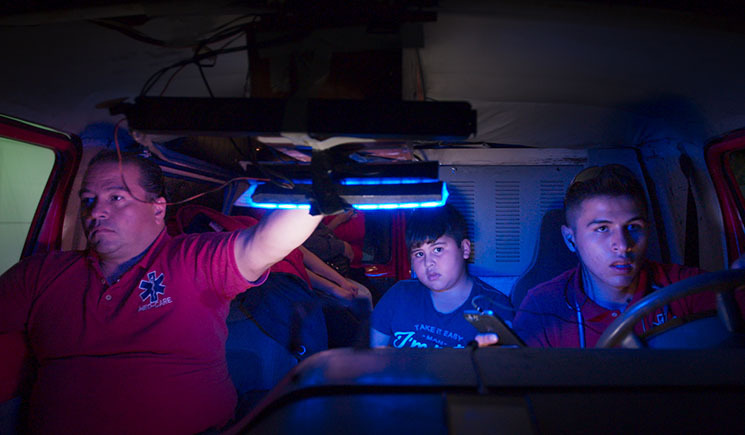 The Ochoa family spends their evenings running one of the city's many for-profit emergency vehicles. To do so, they scan police radios, bribe officers and race other unofficial ambulances at white-knuckle speeds in order to scoop up injured civilians before a competing company beats them to it. Then, because their organization is unofficial, they must barter with their patients and patients' families in search of payment. Making matters even more absurd, the Ochoa's business is mostly operated by the 16-year-old Juan. Sure, his father Fer acts as a figurehead when he needs to pay off the cops, but Juan's the one calling the shots as he barrels down the city streets. Meanwhile, his 9-year-old brother Josué is often playing with toys near the medical equipment or napping in a cubby hole. If the documentary has any potential problem, it's that it's shot too well. Director and DP Luke Lorentzen, who previously helmed the camera for Netflix's excellent football doc Last Chance U, frames his shots perfectly, enriching them with beautifully saturated colour. Considering how the story is already so unbelievable to begin with, the perfect pictures occasionally suggest the whole thing's scripted. It's not, though. In fact, Lorentzen's handling of the subject matter is deftly light-handed as he expresses the dubious morality of the Ochoa's business plan through subtle reveals and careful editing. As such, Midnight Family is exhilarating but never sensational, as it uncovers a shocking, underreported anomaly in Mexico City.